Summary: How is it that you suddenly notice a person? How is it that one day Digby was my best friend’s admittedly cute twin brother, and then the next he stole air, gave jitters, twisted my insides up? There was A LOT of hype around this YA contemporary in the summer of 2016, so as a fan of YA contemporary i figured i should probably pick it up. When buying contemporary, i generally glance at the summary one time, forget about it before buying it and putting it on my shelf for months. That’s exactly what i did here, i went in completely blind. First of all, this story is a lot deeper than i thought it would be. It deals with death and tragedy, abandonment and mental health issues. It also deals with the fact of young girls growing up too quickly. Some of these topics i felt were dealt with well, and some not so well. A lot of the topics in this were brushed over and ignored for the most part. That i didn’t love so much. One thing that was fantastic about this novel was the character development. Whereas i didn’t overly connect with any of the characters and i felt like they fell a little flat, the character development was superb. At the beginning of the story, Lucille the protagonist, i felt to be quite childish for a young woman. She had a very childish mindset of life. However towards the end of the novel she was a brilliant young woman who could stand on her own two feet. I appreciated the writing of that very much. Also the actual writing of this story was very addictive which meant i finished it quite quickly. It was something that i needed at the moment and i cannot fault her writing style at all. It’s perfect for younger or older teenagers (or you know, twenty-somethings too). Going in to this story blind was the best option i think. Whereas i think some of the story-line was a little far fetched and i did a few eye rolls at times, i also found it to be exciting and kept my attention. It’s the perfect story if you need a little bit of a reading break or are stuck in a slump, i would recommend it for that. 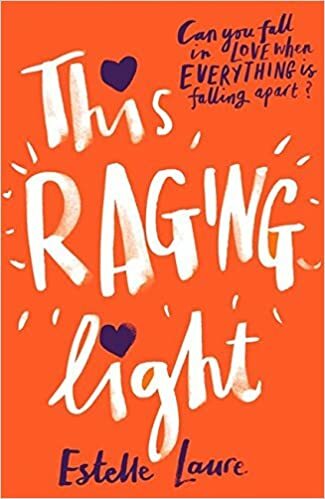 This Raging Light is a great feel good novel. However if you want a riveting read with a lot of action and adventure, i’d give this one a miss. I saw this in my local library and wasn’t sure whether to pick it up or not, though I think I’ll go back now and give it ago. Thank you for this great review!